Begin at the very nice market in Glen Ellen. (The market is full service and best quality and has a nice deli and bakery. They even have picnic tables behind the building for an after-ride lunch.) Leave the village of Glen Ellen by way of Warm Springs Road: a small climb to begin and then flat and rolling for a couple of miles. Turn left on Sonoma Mountain Road and get ready for the first big challenge on this little ride. The road climbs a few hundred feet in around a mile and a half. Some of the gradient will be close to 10%, but most will be half that. This is an extremely nice bike road, with superb scenery—oaks and meadows, vineyards and distant vistas—and hardly any traffic. The lovely road continues for many miles, but we are going to leave it and double back into our local valley by turning right on Enterprise Road and descending for most of two miles through a mix of woods and vineyards and horse paddocks and grand country estates. Enterprise ends with a brief climb to a junction with Bennett Valley Road. Aside from Hwy 12, this is the busiest connector road between Santa Rosa and the Valley of the Moon. Its traffic count is pretty high. However, we will only be on it briefly—a mile and a half—and we will be mostly descending while we are, so it will be over quickly. When this section ends, we bump into Warm Springs Road again. This time, we go left on the less-traveled section of the road and say goodbye—for the moment—to most traffic. Follow this nice road for a mile and a half to a left on Lawndale, which begins with a stiff little climb...just one of many on the day. After a second small climb and a quick descent, Lawndale turns 90° right, but we are going to continue straight ahead on Bristol, then turn right on Schultz for yet another stiff but short climb. Schultz is a longer loop off Lawndale which local cyclists prefer because it is simply nicer to ride: more meandering and more scenic. After that first, brief climb, it rolls along on a more-or-less level traverse of the hillside, and for a considerable distance, passes one of the finest examples of old, dry-stone rock wall in the area. When we return to Lawndale, we have reached the summit on this part of the ride, and we launch off down the hill on a fast, twisting descent that eventually eases off before dumping us out onto Hwy 12, where we turn right. Hwy 12 is a very busy road, all the time. However, the section we’re doing here—into the little town of Kenwood—has wide shoulders. This is where we encounter the optional out-&-back, at mile 13, exactly half way around the base loop. This is a run up Adobe Canyon Road into Sugarloaf State Park. The road is 3.5 miles, so a 7-mile round trip. It is well worth doing if you are comfortable with another challenging climb. The very pretty road rolls along on a gently uphill grade for the first 2.5 miles, often with a charming creek near the road and always in the shade of a dense canopy of broadleaf trees. At the 2.5-mile mark, the road enters the state park and begins to climb in earnest, gaining 500’ in the final mile to the campground. It’s a good, stout pull, but then of course it turns into a wild descent on the way back down the mountain. Pavement is excellent throughout. Water is available at the ranger station in the park, at the top of the climb. Back to the main route in Kenwood. Once again we return to Warm Springs Road, bailing off busy Hwy 12 for another section of this quiet, pleasant back road. This time we’ll revisit the section we did prior to Lawndale, heading back toward Glen Ellen. We’ll also do the section of Warm Springs we missed with our hilly exploration of Sonoma Mountain. 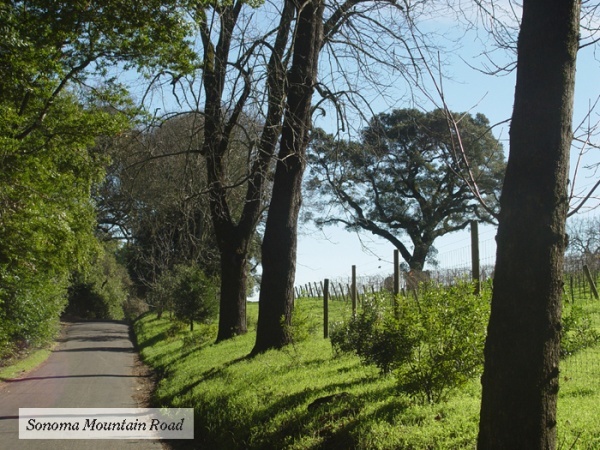 When we arrive back in Glen Ellen, we still have more roads to discover. Just on the edge of town, turn left on Henno Road. This is another very quiet lane made for cycling. It climbs very gently for about a mile and a half before teeing into Dunbar Road, where we turn right. 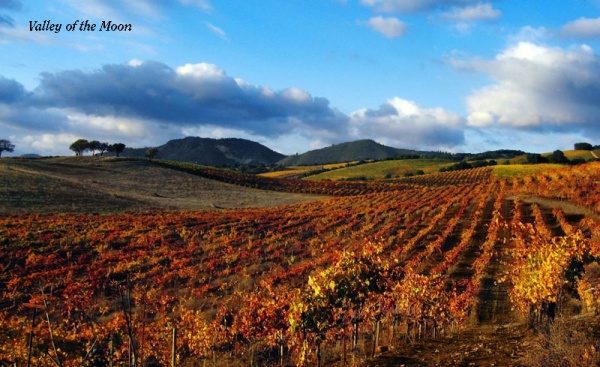 Dunbar offers more of the same: quiet miles through vineyards and oak woods and meadows, past several very up-scale estates. At the end of Dunbar, jog left a few yards, then right on another section of Hwy 12. This section is very brief—half a mile—and also has adequate shoulders. We escape the highway this time by turning into Sonoma Valley Regional Park. There is a very nice paved bike trail through the park, mostly downhill or level from this direction. The trail dumps out on Arnold Drive, where we turn right and head back toward Glen Ellen again. But as we did before, we will almost return to our start site, but then veer off on one more adventure. We turn left on little Chauvet Road, which skirts around the uphill edge of the town, then left again on London Ranch Road. 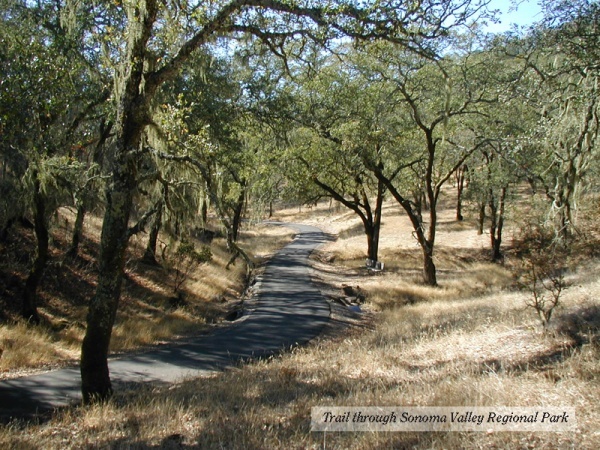 This is a one-mile long but always gradual climb to the state park built around the ranch of famed author Jack London. This is an out-&-back. The ride up the hill—and back down—is worth it purely on its cycling merits, but the park and its historical attractions are worth the journey as well, and if you have cycling shoes suitable for walking, you can visit a number of points of interest around the estate. This short but densely packed ride ends with that fast, smooth descent back to Glen Ellen, where the picnic tables await.